The bold patterns of The Perlman Project N-2 rug complement a sleek chair from Poltrona Frau and a modern desk by architect Peter Bohlin of Bohlin Cywinski Jackson. Designer Linda Perlman first fell in love with Native American textiles when she served as a trustee at the Minneapolis Institute of Art. “The museum has an incredible collection, and spending time among those beautiful, historic pieces stirred my passion for the original patterns and colors,” Linda says. 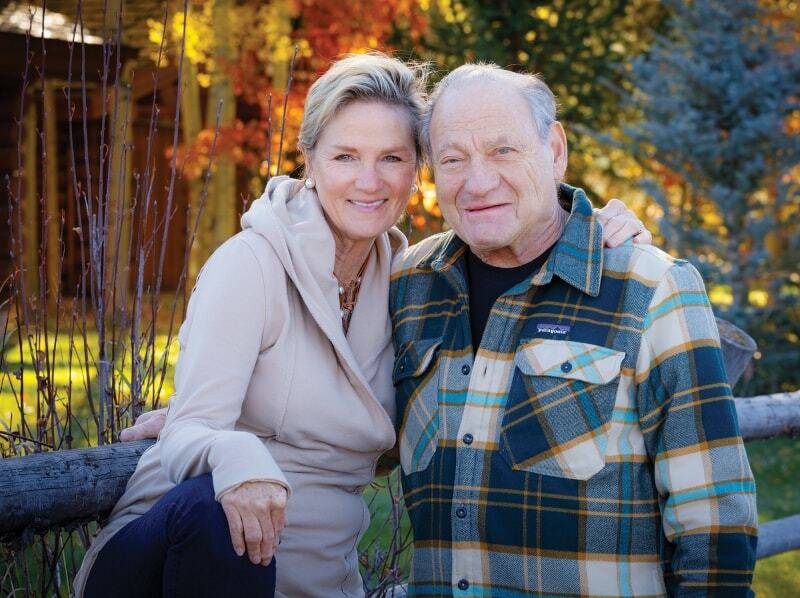 An interior designer for the past 30 years, Linda especially enjoys working with architects, other designers and individuals at the company’s Jackson Hole showroom. “Whether they’re doing a new build or renovating, our customers can specify the exact designs and dimensions before construction even commences,” she says. 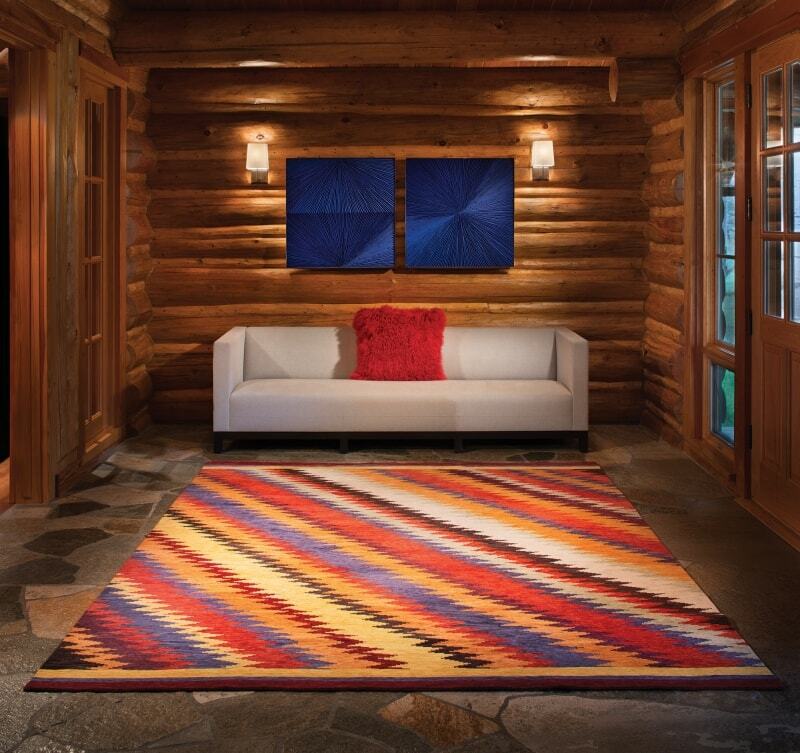 Clients can customize and modify the rug patterns in the company’s portfolio or create their own designs. 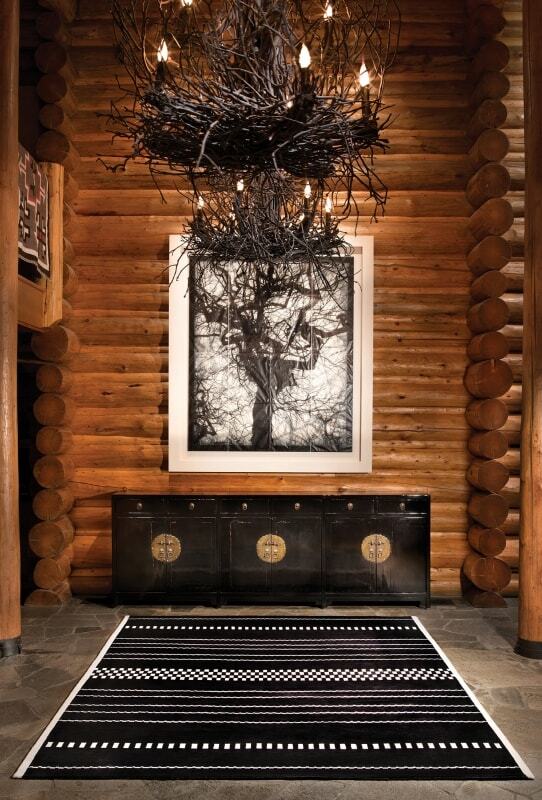 Q: Being based in Jackson Hole, you have such a wonderful diversity of galleries to source great art. Can you share a few of your favorites? A: Heather James Fine Art is a contemporary gallery that we love. Astoria Fine Art on the Town Square has Western art and sculpture and a few modern pieces. We frequent Fighting Bear Antiques for Native American artifacts and furniture, and we love Altamira for Western contemporary artworks. Q: What’s a favorite object in your own home? A: Twenty years ago when we were in Paris, we came across the most wonderful puppet store called Clair de Reve on the Ile Saint Louis. Larry bought me a charming chef marionette puppet that’s 3 feet tall. He hangs in our kitchen where he oversees our cookbook collection. Q: Who are a few of your favorite artists? A: We have so many artists we like! Some of our current favorites include Mark Rothko, Frank Stella, Norman Bluhm, Man Ray, Luis González Palma and Ori Gersht. Palma’s and Gersht’s works are part of our personal photography collection. Q: Where do you enjoy dining in Jackson Hole? A: Snake River Grill has a beef tartare pizza that we enjoy often. At the other end of the spectrum, the Stagecoach Bar in Wilson, Wyoming, has fabulous Mexican food and hamburgers. A: We love to cook and have people over, typically in smaller gatherings of four to eight. Even for casual affairs, we like to put out beautiful linens, china and crystal. We have a 17th-century Chinese black lacquer dining table in our open living area that faces views of the mountains and creek. We’ll dim the lights and start a fire in the fireplace and serve something special like slow-braised lamb shanks or coq au vin. A: Linda is Swedish, and whenever we visit our former home town of Minneapolis, Minnesota, we always visit Ingebretsen’s Scandinavian market and stock up on rye bread, Brunost cheese, pickled herring and head cheese. In addition to those treats, we always have yogurt and blueberries in our refrigerator. Wish Designs chandeliers are crafted from hickory twigs. The black and white patterned rug is N-3, and the art, Untitled #6, is by Doug and Mike Starn. The black lacquer buffet is from the Perlmans’ collection of Chinese antique furniture. 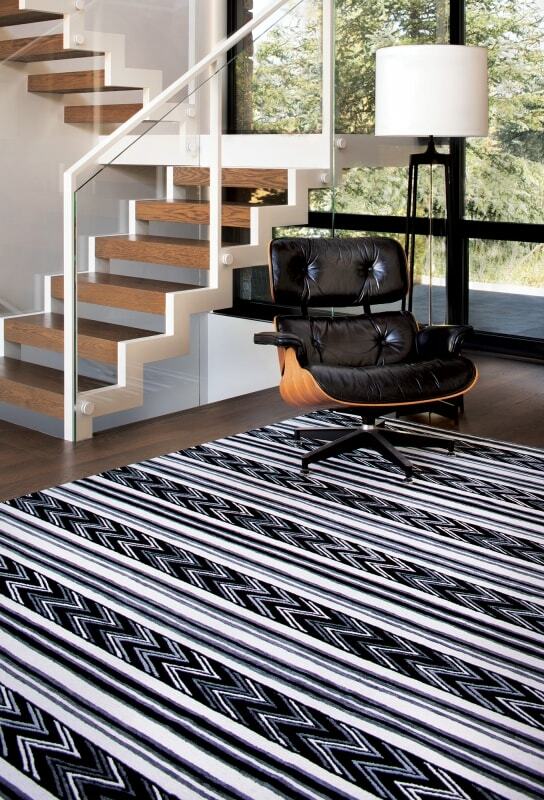 The N-4 rug in custom-dyed hues of gray, black and cream looks right at home in a contemporary setting. The chair is an original Eames lounge chair by Herman Miller.